Where “YYY” is a network interface name like “Wireless Network Connection”. ‘ms_sstpminiport’ which is causing the problem. Vodafone VMC Lite does not want to connect to the network if if is executed under Windows XP user with restricted privileges. The software comes up, but saying “No device” and no chance to connect. How to resolve this: Login as Administrator, Uninstall VMC Lite and install full featured VMC software from Vodafone. Connect to the network. Then login as user and try to connect again – it should work now. Bear in mind that WinXP is treating every USB port available as separate instance, not connected to each other.. so being logged in as Administrator plug in USB modem to every available port and connect. Otherwise you’ll hear moans from users saying modem is not working. Simple solution, but I’ve spent quite a time to figure out the way. Sometimes you need to remove device driver manual, because Device Manager in Windows does not want to remove anything and gives you “Error 31”. If this is your case, this is the guide for you. I’ve spent a sleepless night trying to figure out how to fix this problem.. In my case that was Network Adapter Drivers that did not want to work. Wireless adapter did have a yellow triangle and in properties it showed Error 31. All the attempts to remove the device or driver did not work – the device just appeared again. So I had to manually remove the drivers. 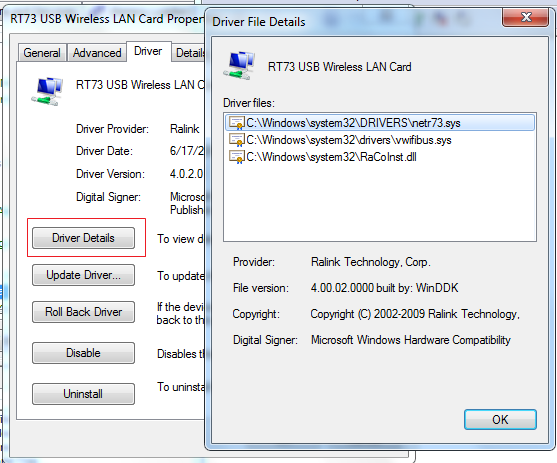 Run device manager find your driver file and *.inf file are used by this device. I came across Aser Aspire One manual which is quite handy, as it has loads of pictures and talks about taking apart that laptop. When WinXP is not executing any applications or *.exe files, this likely that the system is full of viruses, so better do a full scan with anti-virus that is run from bootable CD (there are a lot of them available, like Hiren’s CD or bootable Dr.Web). After virus clean-up download this registry fix file and run it. This should fix the problem. This might not work if Windows is running. You can boot from LiveCD or start Windows in Safe Mode and delete this files from there. Problem: Vista can not connect to wireless network.. the system can not see the DHCP server in router and getting 169.254.x.x ip address which is private and no use at all. Where GUID is a id for that network adapter – you will see the difference if another one is wired and connected. Add new entry (DWORD 32), call it DhcpConnDisableBcastFlagToggle and assign value 1. Change entry DhcpConnForceBroadcastFlag to 0. Put into your Linux box a HDD with NTFS system on it.. you would want to be able to read and write to it under user account, not only as root. where sdb1 is the name of that HDD you want to mount, and userID is your username.